Guess who's back in town?! :) Yes, after 3 months I am back and despite the fact that schools starting for us today - I am so happy to see Sam again! We had a very eventful day catching up and getting back into our usual selves with each other :) Anywho, onto the post! Ps: I will have my favorites post up within the week :) ! I've always pondered upon the quality of Topshop makeup and I finally gave into a couple of their products earlier this month. Topshop launched their in-house makeup collection in 2010 and since then there's been hype about their nail polishes, lipsticks and their creme blushes. I managed to get my hands on their brow pencil and their lipstick and have been testing them out for about two weeks now. I was looking at the colours that they had to offer and to my disappointment they didn't have as many colours as I hope there'd be. I believe there are only 11 shades available in Singapore and about 8/9 in Hong Kong. I've always liked the simple packaging that Topshop beauty products comes with hand draw illustrations ( on their creme blushes ) and text. It just separates it from the rest of your products within your beauty drawer. 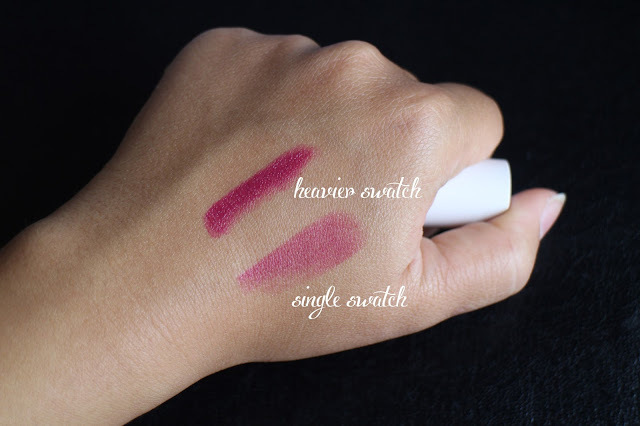 It's definitely a buildable colour, I personally like wearing it with just single swatch on a day to day basis, but even with the heavier swatch, the colour is absolutely gorgeous and wearable! The texture is rather creamy, isn't drying and has a slight bit of sheen, no shimmer is present. If you can't already tell, I have a thing for berry/ plum shade lipsticks, I've always felt that those went well against my skin tone. In the photograph above, you can see that I've already prepped my lips with a lip balm before application, however the lipstick is decently moisturizing on its own. A very berry shade indeed and it reminds me of a slightly muted version of M.A.C's lipstick in rebel. I love this lipstick, it's a very versatile colour that I can wear on an every day basis as a light wash or build it up for a night out. Sadly the only downside I find to it is the lasting power. It does wash out completely after about 4 hours. 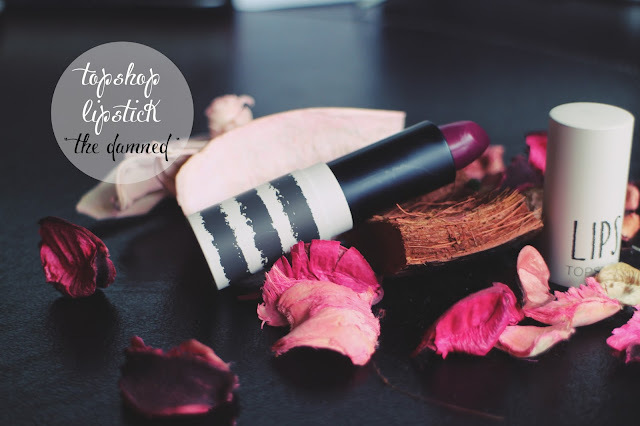 There isn't a significant scent to the lipstick either, although people have claimed that it has a floral scent to it. I really like the colour and will definitely be wearing it more often. 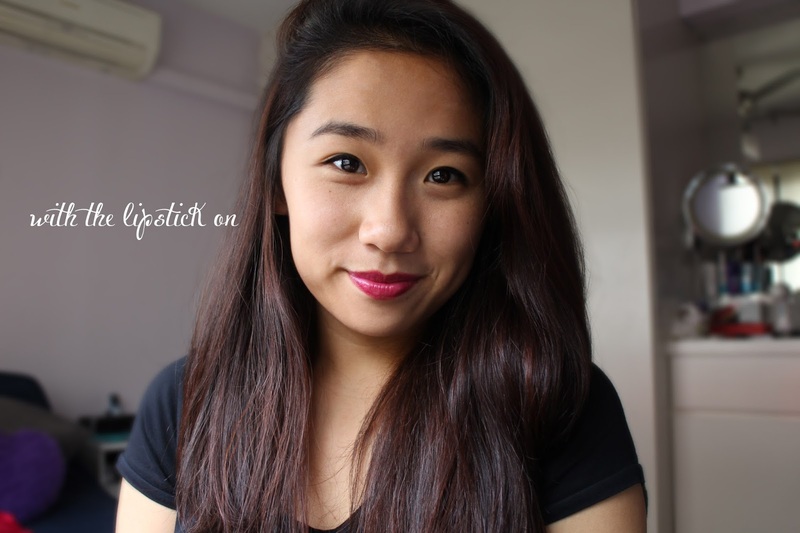 If you are starting to experiment with slightly bolder lipsticks, try this shade! Its not too overpowering but still has that pop of colour! yes! despite the lasting power I am a fan of the colour and Should I try out any other shades, I'll be sure to keep you all posted! What's your favourite Topshop beauty item? woooo such a damn cool colour!